it's so pretty Che, so wonderfully taken, love this. If not for macro would we ever know how beautiful the heart of the flower is? Wow!!! You've captured it's pure beauty. Amazing shot. :) I love shots that make me smile...yours did! its seems like pretty flowers from the heart of a truly beautiful flower...terrific shot indeed!!! The detail is wonderful in the shot. yellow and pink....so girlie and lovely sis! Excellent focus, color and depth of field. Oh my word! this is indeed a stunning shot. Love the color. I agree with Ruthi, stunning. Did you use a macro lens, girl? I can see the pollen and they look as if they are alive! :) Amazing shot! won't get tired looking at this shot Che, so pretty and beautiful!! Short, pretty and seet pink sharing. Just the way I like it. You sure have a way with a camera - beautiful work! What kind of flower is it? 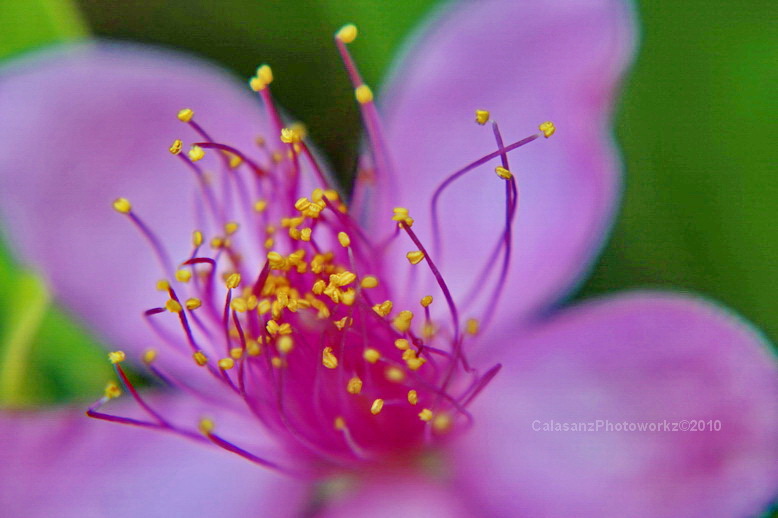 Very nice macro... lovely sharp focus on the pollen bearing anthers and a wonderful bokeh! Lavender is one of my favorite colors and this flower is stunning. A lovely capture. I am so happy spring is here so I can see all of these stunning flowers. Gorgeous details and color in this image.